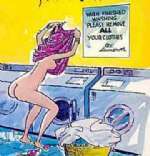 This dumb blonde removes her all clothes after reading this sign "When finished washing please remove all your clothes" at the Laundry. Why can’t blondes dial 911? View - Why can’t blondes dial 911?